“Languages known by interpreters: Arabic (2), Albanian (2), Armenian (2), Bohemian Czech (4), Bosnian (1), Bulgarian (5), Croatian (7), Dalmatian (2), Danish (2), Dutch (1), Finnish (1), Flemish (1), French (14), German (14), Greek (8), Herzegovinian (1), Italian (11), Lithuanian (2), Macedonian (1), Hungarian (4), Montenegrin (4), Moravian Czech (1), Norwegian (2), Persian (1), Polish (6), Portuguese (1), Rumanian (4), Russian (6), Ruthenian (4), Serbian (6), Slovak (7), Slovenian (2), Spanish (2), Swedish (3), Turkish (6), and Yiddish (9). “Thirty-six interpreters are given credit in the above table for languages with which they are but slightly acquainted. For instance, they may be able to speak them but cannot read or write them. Again, some may be able to read them but cannot speak them. “Thirty-six interpreters are in one sense a large number, but in another are not. There are twenty inspection lines, all of them full during numerous successive days in the year, and there are always four [special inquiry] boards, usually six and sometimes eight. 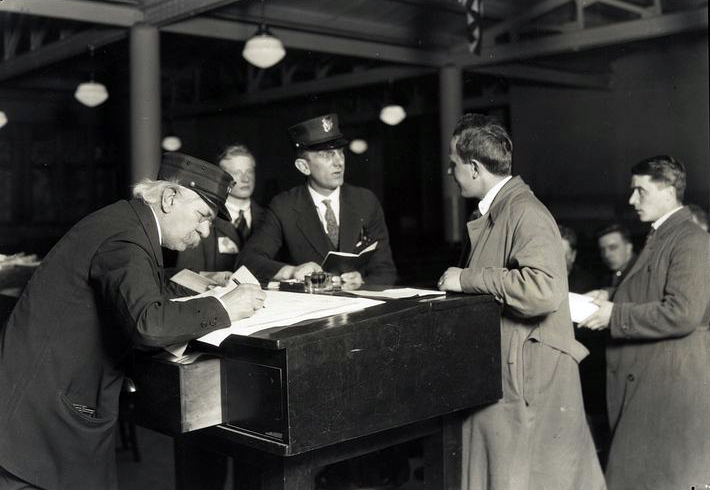 Then there is the Boarding Division with the poor quality of people arriving in the second cabin (placed there often on advice that they could not enter through the steerage). And there are also the appeals before the Commissioner, requiring the presence of one or more interpreters between 11 a.m. and 1 or 2:30 p.m. every day. “I should add that there are a number of investigations in New York City which it falls to the lot of the interpreters to make. You will perhaps have to take my word for it that we are very short of interpreters, but in giving it I assure you it is based on full knowledge of the situation. “The Chief of the Registry Division constantly has to surrender men to the boards and vice versa, at a time when both of them need the men. With the 20 lines filled, one-third of them we will say with immigrants knowing only Slavic languages, it is obviously impossible for our interpreters who know Slavic languages to be on all those lines, let alone to be doing boards work or the other kind of work which it may be imperative for them to do at that particular time. “The languages with which they should be familiar are named below in the order of their importance, viz. : Italian, Polish, Yiddish and German, Greek, Russian, Croatian and Slovenian, Lithuanian, Ruthenian and Hungarian. Each of the five interpreters should be able to speak at least two of the languages named and it is very desirable that all of those named should be spoken by the fine interpreters collectively, if practicable.